Sweat and blisters: a part of the Norwegian lifestyle. Sweat trickles from sunburnt foreheads as we climb the last, rocky slope, feet already sore inside the hiking boots. “Just five more minutes and you’ll see the view”, says Nils Hole, a retired science teacher and leader of the local mountain hiking club for ten years. Without much else in the way of warning, after walking steadily uphill for two hours, suddenly the mountain comes to an end and a huge panorama reveals itself. Some 1,100 meters below, a river coloured turquoise by glacial melt water winds through a lush, green valley, past farms and pastures, flowing into the fjord by the town of Åndalsnes. Mighty, alpine mountains tower above, a layer of snow still resting in the slopes beneath their pointy peaks. The Romsdal alps are a dramatic sight. “Nowhere else do you have the fjord surrounded by these grand, alpine peaks. That’s what makes this place so unique”, says Hole, still enthralled by the vista after countless treks onto every mountaintop in view. “I think most people and families would consider the trail too hefty to walk without any safety measures. Yet just placing a few metal chains has made hikers feel a whole lot safer. It’s opened up the mountains for a much larger audience”, says the guide. 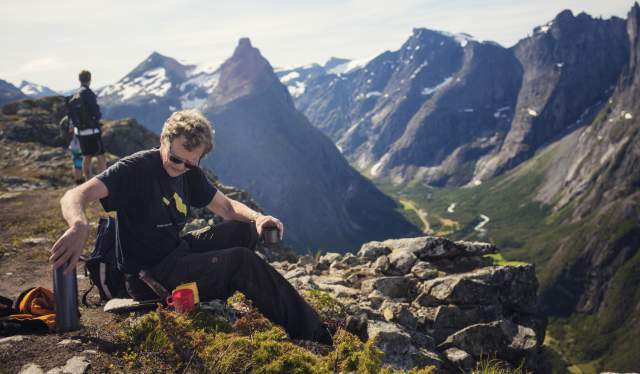 Far from wanting the magnificent view for himself, Hole embodies the very Norwegian spirit that one can perhaps catch in words like friluftsliv (literally “free air life,” the lifestyle of outdoors recreation), and dugnadsånd (meaning “the spirit of voluntary work”). Norwegian law explicitly addresses the right to perform friluftsliv, including the freedom to roam through privately owned land, with the purpose of promoting health and well-being. It’s an important part of Norwegian culture. As for the dugnadsånd, one prime example is the old tradition of building cairns. From time immemorial, the people who have trodden up mountainous paths have left cairns at visible points – large, pyramidal stacks of stone – to mark their trail. In fog and stormy weather, these distinctly visible structures lead the way. The phenomenon of “cairn books” are a natural continuation of that very same drive. Attached to the large cairn at the peak of the mountain Blånebba (1.320 meters above sea level) is a mailbox. Nils Hole produces a waterproof bag and digs for the thick notebook he knows he’ll find inside. “This is full, I should’ve brought another one,” mutters Hole to himself as he scrolls through the book, no doubt flipping past his own name several times. “There are such books on just about every peak now. You can even register with a code on your mobile phone,” he says. After the last peak, on the way to Nesaksla, you’ll see the most notable cairn of them all. Aakesvarden was built on one Sunday in July more than 100 years ago, in 1908. Hole knows the story well, as well as the names of the people who built it. They came from the Aak farm in the valley beyond the cliff, where today there is an intimate and charming hotel, Hotel Aak. “It was a time when people really knew the technique of dry walling”, says Hole, who has taken part in building a similar cairn further up the same slope, though not quite as tall as this one. They did not want to surpass the original, which is about three meters high. “The fact that they’ve built it on the very edge of the cliff, and it has stood solid for more than 100 years, I think is fantastic. And up here, there’s a real wind”, he says. The trail is not to be taken lightly – like a wild animal in captivity, it is only tamed, not quite domesticated. Nonetheless, today you’ll see families, young and old alike, following the ridge. Three different routes with various difficulty levels – from moderate to extreme – are prepared, and considerable efforts have been made to make them as accessible as possible. Where as a kid he had to climb, today there are stairs, made by Nepalese Sherpa, elite mountaineers using age-old techniques from the Himalayas. From Åndalsnes at sea level to Nesaksla 708 meters above, there are now stairs that locals run for exercise. Coming down the other way, having followed the entire trail to the end, at first you probably wouldn’t find that particular idea very tempting. 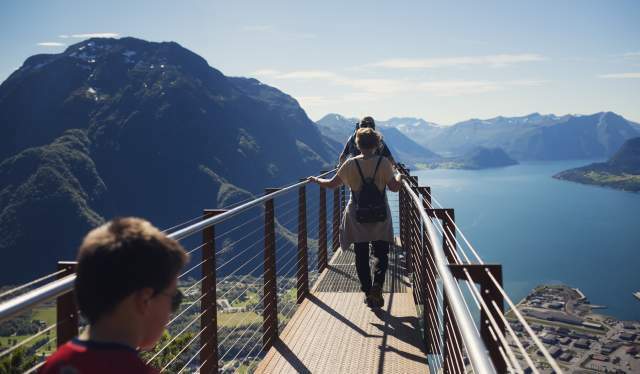 Though once the blisters fade and you’ve caught your breath, you might crave that fresh air and that spectacular view once more – and you’ll get why so many Norwegians get hooked on friluftsliv.